mikepasini.com | Photo Corners | It's 2016! Once again (and we're not complaining when we say it), the New Year brings its own rituals here. We've snuck away from the Rose Parade to scribble, "It's 2016!" on a Post-it note we immediately stuck to a spot our eyes can't avoid. We picked up this little ritual from the weekly newsmagazine we worked on for 30 years. The publisher would put up a similar little note to remind everyone which year it was. Wisely, he put it up on the clock in the production area. He knew everyone looked at that clock several times an hour. There's no avoiding the years at a magazine. Almost every page that isn't an ad has the date somewhere, starting with the cover. And the boss's little reminder -- always with an exclamation point -- placed right where we'd all see it every few minutes, saved all of us more than a few times from living in the past. You check your smartphone for the time. And where the year does appear (like on our footer just below), a smart little piece of code figures it out so you don't have to rely on us to update it. Our little note may be mainly nostalgic but another little ritual around here is worth recommending. It has to do with the copyright notice some of our cameras add to each image. On cameras that don't offer that option, we use Copyrighter Pro to add a copyright notice to their images. If you rely on Copyrighter Pro, too, you'll be glad to know the current year button is self-updating. So today it says "2016" rather than "2015." But our Nikons use either the Comment area or a dedicated Copyright Notice function to add our copyright notice to the Exif header of each image. No image leaves our Nikons without that copyright notice. If you do the same (and it's not a bad idea), take a moment before you start shooting to enter the new year. 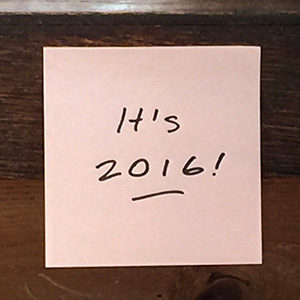 As it says on this Post-it note here, "It's 2016!"